This rustic looking mid-1960s scene is an image of Fieldgate Lane at the junction of Fancott Drive. The ‘then’ photo was captioned as ‘Old Cob Building’ which relates to the cottage on the right, which has since been demolished. Cob is defined as “a natural building material made from subsoil, water, some kind of fibrous organic material (typically straw), and sometimes lime”. The etymology of this seems to be from an old Proto-Germanic word meaning something lumpen, from which the clumsy mending of something described as “cobbling together” also comes. The technique is staging somewhat of a comeback due to the inherent sustainability of the materials used. On the right of the modern picture is Fancott Drive, which runs to the rear of the old Fancott’s Bakery premises, which became the Old Bakery pub and hotel. 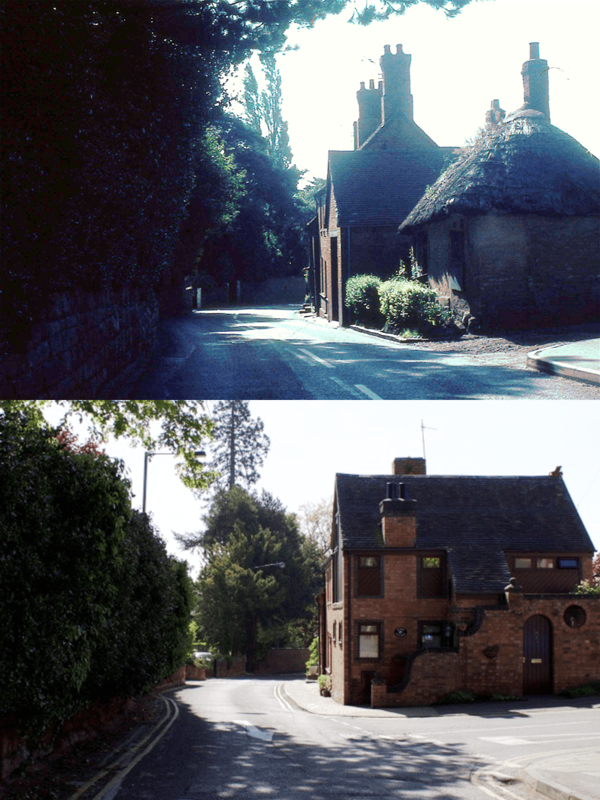 According to A Portrait of Kenilworth in Street Names (Rookfield Publications, 2015) by Robin Leach & Geoff Hilton it was named in 1987, built over an existing narrower lane, visible (right) in the ‘then’ image above. The book also contains the origins of Fieldgate Lane, formerly Hogg Lane in 1692 or More End Lane, which was possibly renamed circa 1835 after Fieldgate House on the corner of Fieldgate Lane and Beehive Hill. The garage building behind the old cob building was also later redeveloped as Mews Cottage. The truncated chimneys of number 16 Fieldgate Lane are just visible over its roof line today.